This beauty is the work of Sara (otherwise known as craftyjewishmom) and is pictured on her blog with some other pretty samples too. There are assorted other interpretations around the web. 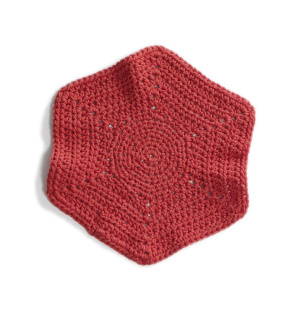 Basically all of them are the same concept, you fold the hexagon to form one half of the baby sweater. Almost like magic!. Needleworkersroom. offers her own pattern for us to follow. 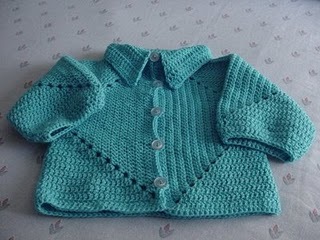 It certainly turns out a lovely sweater, perfect for a boy or girl. 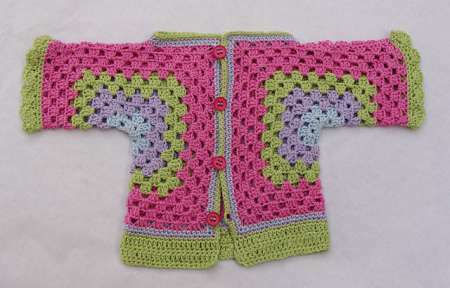 Another good resource for this hexagon jacket pattern is bevscountrycottage.com complete with pictures and free pattern. I’ve made one following the ‘basic’ pattern and created a pullover. It’s kinda magical the way the two wiggly hexagons work up to a perfectly proportioned toddler sweater when made in worsted weight and an H hook. 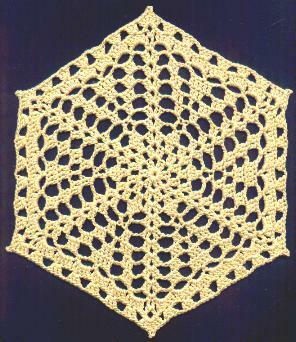 Now, I’m considering playing with some other hexagon patterns to create a pattern for adults. These two hexagons have my attention right now. I think both could be worked with extra stitches so they’d magically turn from a hexagon into a ‘square’. What do you think? Hi JD, thanks so much for this great post! If you figure how to add stitches to that lion brand hex with the circle in the middle, please let me know, that would be fabulous! All the best! The baby sweaters are adorable looking! 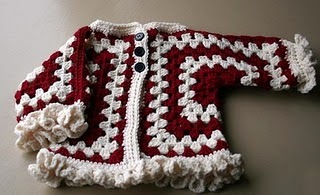 I wish I had the ability to make such sweaters back when my little boy was little. For an adult, what we need to do is create a hexagon that folds to fit nicely from center back to center front. Once we have a hexagon that size, we can proceed with assembly the same way the baby surprise jacket is assembled. I, too, have thought about making this one in an adult version for myself. I think it’s something we can make without a pattern if necessary.